Disney is on a role with their movies, both animated and live-action, and the production value is part of the reason why. The time taken to create the set pieces that come to life and all the special effects sequences are incredibly done and, though they had the potential to, don’t seem cheesy or fake in any way. Disney is always trying to reinvent itself; from new attractions at the theme parks to merchandising to their latest animated successes like Frozen and Moana. The same can be said for one of their newest ventures, turning their animated movies into live action films. First, there was Maleficent then Cinderella and now we have Emma Watson (the Harry Potter Series) and Dan Stevens (The Guest) in Disney's latest live action endeavor, Beauty and the Beast. The beloved classic comes to life in the Blu-ray combo pack, in stores this week. We all know the "tale as old as time"…Belle's (Watson) father, Maurice (Kevin Kline; A Fish Called Wanda), becomes a prisoner in a castle that seems to be alive. When she comes to rescue him, she learns he is being held by a beast (Stevens) and offers to trade places with her father. Hoping she will break the curse, the Beast agrees and takes her instead. After a period of time, he falls in love with her. However, when Maurice returns to the village and tells them of the Beast's existence, he is once again locked up, this time for being crazy. Belle eventually returns, shows the villagers the Beast in an enchanted mirror and starts a gang of people, led by Gaston (Luke Evans; Dracula Untold), to hunt and attempt to kill the Beast. Ultimately, Gaston is the one dead and Belle professes her love for the Beast, breaking the spell and restoring him to a handsome Prince. Watson is an excellent choice to play Belle as she is not only incredibly talented but beautiful as well. She sings well enough and makes Belle into a stronger version of the animated woman. While the latter has softer edges than Watson's Belle, these times and this film call for a tougher character than we have previously seen. Stevens is also well cast and these two actors are surrounded by a fabulous, all-star cast including the perfectly cast Evans, Josh Gad (Frozen), Ewan McGregor (Trainspotting), Emma Thompson (Love Actually), Ian McKellen (The Lord of The Rings), Audra McDonald (Private Practice) and Stanley Tucci (The Devil Wears Prada). The songs and scenes we love from the original mostly remain but Director Bill Condon (Dreamgirls) also added some terrific new songs and additional backstory for both Belle and the Beast's characters. The ballroom dance sequence is beautifully shot and the large musical numbers are so well done you think you are watching an elaborate Broadway play. The 1080p high definition video has an aspect ratio of 2.39:1 giving the film a full-bodied experience when watched on a television screen. The colors are fantastic and vibrant, especially Belle's ball gown. The audio is extremely important in this case and is presented in DTS-HD Master Audio 7.1. The orchestration is robust and hearty and plays beautifully across all audio channels. The Blu-ray offers a number of terrific extras, especially a 13 and a half-minute look at the first table read including an orchestra and ensemble singers and dancers. There are also features about the behind-the-scenes of the film, the female crew members of the movie, making the musical sequences, deleted scenes, Celine Dion's role in the original and new films, Karaoke versions of the songs and the music video for the song Beauty and the Beast. All of the extras are well worth watching and informative. Disney is on a role with their movies, both animated and live-action, and the production value is part of the reason why. The time taken to create the set pieces that come to life and all the special effects sequences are incredibly done and, though they had the potential to, don't seem cheesy or fake in any way. 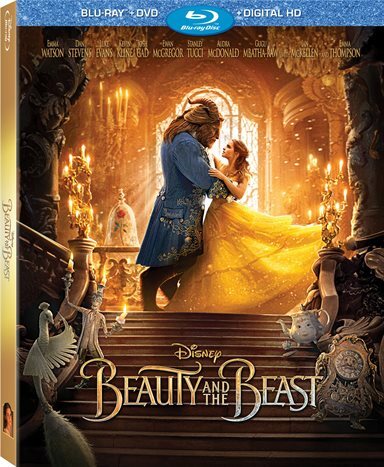 Beauty and the Beast is a classic story and both the animated and this new live-action version should be part of any home video library. Download Beauty and the Beast from the iTunes Store in Digial HD. For more information about Beauty and the Beast visit the FlickDirect Movie Database.